Planning included a five year re-vegetation plan which commenced in 2009 to re-establish the indigenous vegetation on the slopes above the fern gully. This was preceded by propagation of plants with the correct provenance. 2008 seed was collected from the 2 dominant over storey plants Eucalyptus viminalis viminalis and Eucalyptus obliqua as well as Acacia melanoxylon. With the assistance of The Tree project team volunteers propagated 4500 plants in the first year. 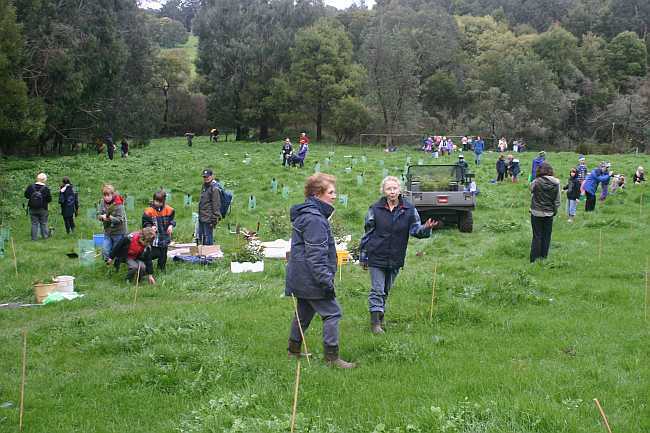 2013: Toorak College students added to the workforce which planted another 3500 plants including over storey and mid storey species completing the 5 year re-vegetation plan. 2014: Re-vegetation continues filling in the gaps in the western area and replacing any plants not surviving. This buffer of plants, some of which are now over 10m tall, will protect the fragment of native vegetation in the gully from the invasion of pasture weeds. Initial planting on the western side consisted of over-storey plants:Blackwood (Acacia melanoxylon), Manna gum (Eucalyptus viminalis viminalis) and Messmate (Eucalyptus obliqua).